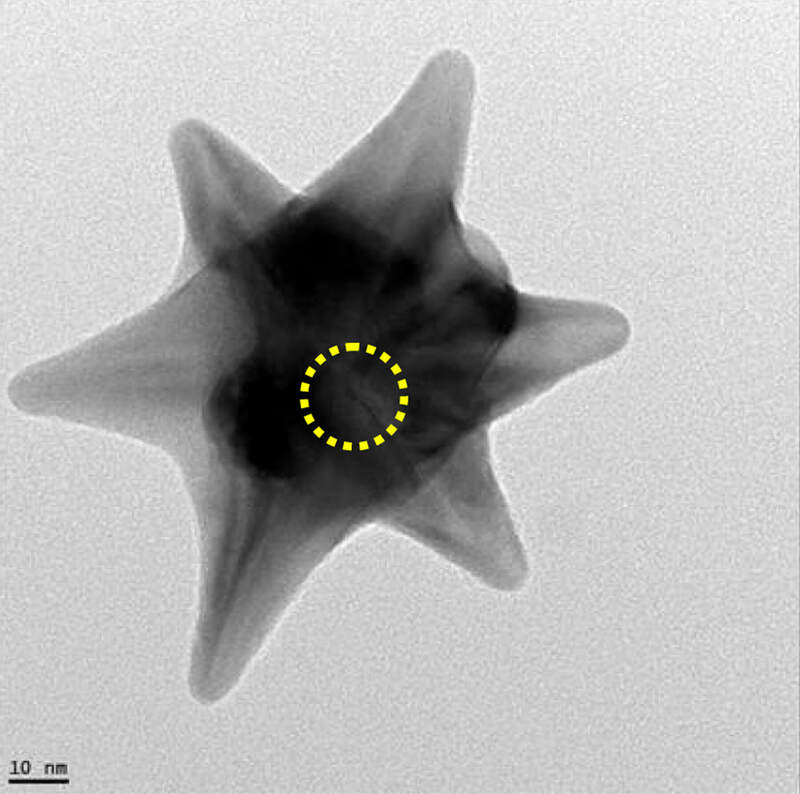 Purdue University researchers have created magnetically responsive gold nanostars that may offer a new approach to biomedical imaging. The nanostars gyrate when exposed to a rotating magnetic field and can scatter light to produce a pulsating or "twinkling" effect. This twinkling allows them to stand out more clearly from noisy backgrounds like those found in biological tissue. 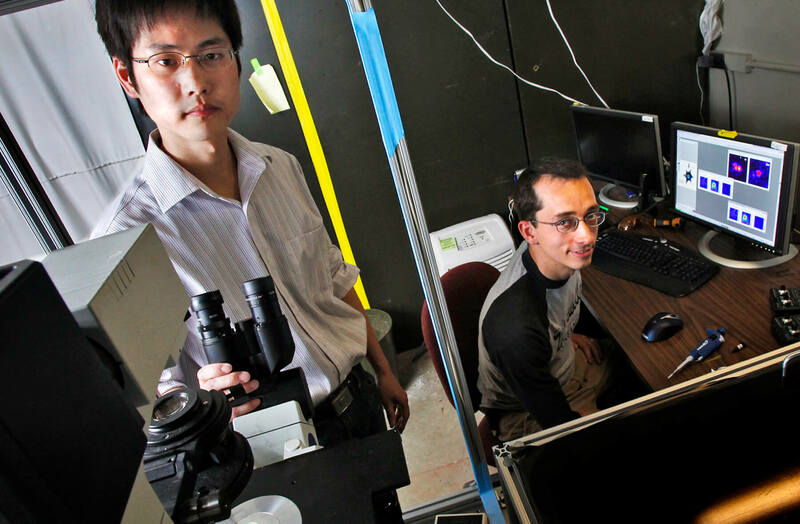 Alexander Wei, a professor of chemistry, and Kenneth Ritchie, an associate professor of physics, led the team that created the new gyromagnetic imaging method. "This is a very different approach to enhancing contrast in optical imaging," said Wei, who also is a member of the Purdue University Center for Cancer Research and the Oncological Sciences Center. "Brighter isn't necessarily better for imaging; the real issue is background noise, and you can't always overcome this simply by creating brighter particles. With gyromagnetic imaging we can zero in on the nanostars by increasing signal strength while cutting down on background noise." Any signal that doesn't have the frequency corresponding to the rotating magnetic field can be suppressed in the images, eliminating background noise, Ritchie said. "It was surprising how well this method enhanced the imaging," he said. "It can improve the contrast of the particles to the background noise by more than 20 decibels and can clearly reveal a gyrating nanostar, where with existing direct imaging methods in many cases you wouldn't be able to definitively find a particle." Gold nanostars and other gold nanoparticles have recently been examined as contrast agents for biomedical imaging because of their brightness at near-infrared wavelengths, which can penetrate through tissue better than visible light. However, giving them the ability to twinkle was key to developing a novel dynamic imaging method, Wei said. "Gyromagnetic nanostars combine strong optical signaling with a unique mechanism for reducing noise, allowing one to pick out the proverbial needle from the haystack," Wei said. "The key is to enable the nanostars to twinkle at a frequency of our choosing. Our analysis picks out signals at that frequency and translates that information into images of remarkable clarity." A paper detailing the team's work is featured on the cover of the July 22 issue of the Journal of the American Chemical Society. In addition to Wei and Ritchie, co-authors include graduate students Qingshan Wei, Hyon-Min Song, Jacob A. Hale, Dongmyung Oh, Quy K. Ong and postdoctoral research associate Alexei P. Leonov. To perform gyromagnetic imaging, the team placed a sample of cells containing nanostars under a standard microscope equipped with a white light source and a rotating magnet. Light was sent through a polarizing beam splitter and into the sample, then reflected back through the beam splitter and to the camera. The camera collected images at 120 frames per second, capturing the signal from the nanostars as they spun at approximately five revolutions per second. The set-up is simple and practical for general laboratory use, Ritchie said. "To translate a new imaging technique into something practical for broad use, it needs to be done without specialized equipment," he said. "Many other imaging techniques require expensive equipment or lasers, but this method can be done with a halogen lamp and a $10,000 camera." After initial data is collected, mathematical operations such as Fourier transforms can be applied to obtain frequency information from the pulsating light signals, allowing the twinkling nanostars to be easily picked out. The use of Fourier transforms in imaging techniques, often referred to as Fourier-domain imaging, is already known to be useful for reducing noise, but the research team's method allows a mechanical frequency to be used as input for selective Fourier-based imaging, Wei said. "We have external control over the speed of rotation, so we will always know what frequency to focus on when looking for nanostars," he said. In testing whether nanostars might harm cells during the imaging process, the researchers found that the particles were not only biocompatible, but could actually promote cell growth, Wei said. The team is continuing to investigate the biological effects of nanostars inside cells. Plasmon-resonant nanoparticles with optical scattering in the near infrared (NIR) are valuable contrast agents for biophotonic imaging and may be detected at the single-particle limit against a dark background, but their contrast is often limited in environments with high noise. Here we consider gyromagnetic imaging as a dynamic mode of optical contrast, using gold nanostars with superparamagnetic cores. The nanostars exhibit polarization-sensitive NIR scattering, and can produce a frequency-modulated signal in response to a rotating magnetic field gradient. This periodic "twinkling" can be converted into Fourier-domain images with a dramatic reduction in background. We demonstrate gyromagnetic imaging of nanostars inside of tumor cells, using broadband excitation: while their time-domain signals are obscured by incoherent scattering, their Fourier-domain signals can be clearly resolved in less than a second. The gyromagnetically active nanostars do not cause a loss in viability, and can even have a mild stimulatory effect on cell growth.